As global demand for rare earth metals rises, China has further tightened its grip on the minerals used in cellphones, hybrid cars and medical diagnostics. 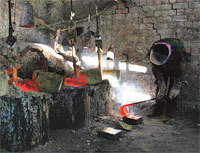 It has cut rare earth export quotas by 35 per cent for the first half of 2011. Last year, it had cut the quota by 72 per cent and halted supplies to Japan, one of its major importers of rare earth metals. The country produces over 97 per cent of the world’s rare earth supply. The government said it wants to conserve its ample reserves. The quotas are also necessary to protect the environment, it said. Illegal mining accounts for over 50 per cent of China’s rare earth exports, leaving waterways and land poisoned with sulphuric acid. Following the latest announcement, South Korea, the fourth largest economy of Asia, said it will explore Vietnam, Australia, South Africa and Kyrgyzstan for rare earth reserves. China’s announcement has also rattled the electronics and mining industries. Electronics giant Sony said the cut was a hindrance to free trade. It plans to reduce its reliance on rare earth metals. Molycorp Inc, a mining company in USA that was once the world’s largest supplier of rare earth metals, plans to reopen its facility. The mine in California was closed in 2002 following complaints of pollution. Australian company, Lynas Corporation, is also set to start mining of rare earths in Western Australia. The countries though have ample rare earth deposits, they had stopped mining them in the 1990s as lower-cost Chinese supplies became available. The Congo has declared a state of emergency after an outbreak of polio killed 200 people in three months. Most victims were between 15 and 24. WHO attributed it to low immunity among adults, poor sanitation and public health infrastructure, and disruption of immunisation programmes. Nearly 480 people were affected by the disease by mid-January. Half of them succumbed to the disease. Scientists said the strain responsible for the outbreak was first detected in Angola in 2007. The strain is also found in India. The government of Congo has launched vaccination campaigns to fight the outbreak. Polio virus usually strikes children under five. About 10 per cent of those paralysed by the disease die. Following protests by environmentalists, Germany has banned cultivation of genetically modified (GM) corn. MON 810 was the only GM crop grown in the country. The EU had approved MON 810 for cultivation in Europe in 1998. Austria, Hungary, Greece, France and Luxembourg, however, banned cultivation of the GM crop. Produced by US biotech giant, Monsanto, MON 810 produces a pesticide inside its tissues to repel the corn borer moth. 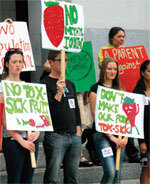 Green groups say GM crops contaminate the environment. Three quarters of coal fields in Queensland have been closed after the Australian state was hit by the worst floods in 50 years. Queensland supplies half of the world’s coking coal, an essential ingredient for the steel industry. Railway lines that transport the coal to ports have also been submerged. The government said the floods could have a long-term impact on the global steel industry. The floods have also damaged wheat crops. Australia is the world’s fourth largest wheat exporter. Met officials have attributed the floods to La Nina, a weather phenomenon that forms in the Pacific and is associated with extreme weather. A group of environmentalists and farmers have sued the state of California after it approved the use of a toxic pesticide for use in strawberry plantations. The lawsuit filed in the state’s apex court challenges the Department of Pesticide Regulation’s approval of methyl iodide, arguing that it violates state laws that protect groundwater against pesticide pollution. Methyl iodide is a known carcinogen. It is used in labs to create cancer cells. Exposure to the pesticide can also cause late-term miscarriages. The US Environmental Protection Agency had allowed the chemical for use as a fumigant in 2007. The chemical is a substitute for the banned fumigant methyl bromide, linked to ozone depletion. A Penan tribe of Sarawak state in Malaysia has sued a logging company and the state government over a plan to fell 15,000 hectares of biodiversity- rich rainforest. In their petition, the tribal community stated that the government has issued license to timber giant Samling for felling Ba Jawi forests without their permission. The forests were inhabited by their ancestors and is a source of livelihood for the community. Leaders of the community claim the contested area is a key region of the Penan Peace Park, which covers twice the size of Singapore, and was proclaimed a nature reserve by 17 Penan tribes in 2009. The state government said the declaration of the forest as Peace Park is illegal. The world’s first field trial to wipe out dengue has started in Australia with the release of thousands of speciallybred mosquitoes into the wild. The 12-week trial in Cairns city involves introducing the Wolbachia bacterium into Aedes aegypti mosquitoes that spread the viral disease. Scientists said the bacterium acts as a vaccine for the mosquito, protecting it from dengue virus and thereby stopping its transmission to humans. It poses no risk to the environment, they assured. An effort in Malaysia to combat dengue by releasing 4,000-6,000 GM male Aedes aegypti mosquitoes has been postponed following protests. Environmentalists said information is not available about the GM mosquitoes and their interactions with non-GM mosquitoes, the dengue virus and humans. Dengue infects up to 100 million people each year across the world. Belgium has become the first country to ban the sale of China-made foam puzzle mats for children after tests showed they contain a cancer- causing chemical. The chemical, formamides, used to soften the foam, is corrosive and toxic to the reproductive system. The Belgian government said it will impose a US $26,000 fine for anyone found selling the toys. Following the suit, France has announced a three-month sale ban on the puzzle mats. Uganda has lifted a trade barrier on beef products from Kenya after over a decade. However, it has demanded regular inspection of Kenya’s livestock for safety. The move was to resolve a long-running dispute between the two countries over beef trade and meet growing demands of beef in Uganda. It had banned beef products from Kenya in 1997 because of intermittent outbreaks of contagious diseases like rinderpest. Kenya disputes the claims and accuses its biggest trade partner of engaging in unfair protectionist practices including use of non-tariff barriers. Uganda had a livestock population of 12 million by 2008 compared to Kenya’s 40 million, as per the Uganda Bureau of Standards.